Chinese White Radish or Giant White Radish is primarily grown for its large, succulent and edible root vegetable. Turnip cake made with Chinese white radish is a traditional Lunar New Year dish. Growing wild, they are regarded as invasive species in many regions. Botanical Name: Diospyros kaki (syn. : Raphanus chinensis, Raphanus gayanus). 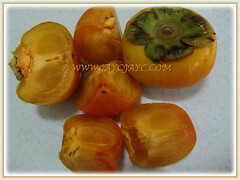 Common Names: Asian Persimmon, Japanese Persimmon, Oriental Persimmon, Buah Pisang Kaki in Malay. Etymology: The genus name, Diospyros is derived from the Greek words dios meaning divine and pyros meaning wheat or grain for this divine fruit. The specific epithet kaki is the Japanese name for Diospyros kaki. Origin:Native to Japan, China, Korea, Burma and Nepal. Plant type: A tree bearing edible fruits. Features: Diospyros kaki is from the genus Diospyros that consists of over 700 species of deciduous and evergreen trees and shrubs. It is a slow growing globe-shaped tree eventually reaching up 9 m in height and spread as wide. Outer branches may droop. Its deciduous leaves are large, measuring 10-15 cm long. Oval to obovate leaves 15.24 long emerge yellowish-green in spring, mature to glossy green in summer and turn gold to red in fall. Trees are usually dioecious but some trees have both male and female flowers and in some cases also some perfect flowers. Notwithstanding the flower types, the tree may set seedless fruit without pollination. Fragrant and creamy-white female flowers appearing solitary and the pink-toned male flowers appearing in clusters of three. Eventually, the flowers will be followed by edible persimmon fruits, 7.62-10.16 cm in diameter mature to bright orange and may persist on the tree. Most fruits are seedless but some may contain a few seeds. 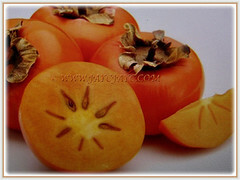 Culture (Care): Diospyros kaki or Oriental Persimmon can be easily grown with least maintenance. Light: Best in full sun. Moisture: Medium water requirements. It is drought-tolerant once established. Soil: Deep, moist and slightly acidic soils. Somewhat tolerant of a wide range of soils but prefers moist and sandy soils. Once established, they need minimal care and require little or no pruning. Fertilize three times a year as you would for other fruiting trees.Generally free from serious garden pests and diseases. Nonetheless, do watch out for scale insects and mealybug that can weaken the tree. For subtropical and temperate regions: Hardiness: USDA Zone 7-10. 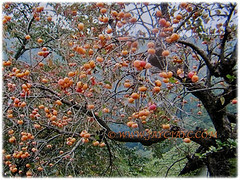 Diospyros kaki or Oriental Persimmon can stand winter temperatures as low as -17ºC yet they need only a short chilling period 100-200 hours below 7ºC. 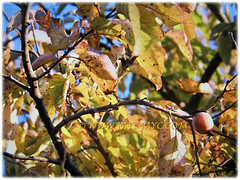 The leaves emerge glossy bronze in spring and turn to orange-red during fall. Although the flowers are not especially showy, they give way to delicious orange, baseball-size fruits that remain even after the leaves have fallen. Propagation: Easily propagated from stem cuttings. 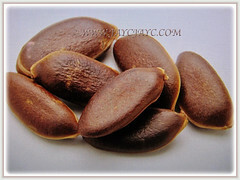 Alternatively, it can be propagated from seeds but the resulting plant will not be identical to its parent. 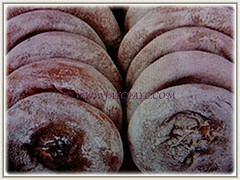 Usage: Diospyros kaki or Oriental Persimmon produces edible fruits that are commonly sliced or eaten whole. Flesh may be added to salads, pancakes, cookies, jellies, jams, marmalades, syrups, puddings, ice creams or pies. Persimmon leaves can be used to make teas. Its fruits can be dried to enjoy eating them all year long. Oriental Persimmon make attractive shade trees with the added bonus of delicious fruit. They can be espaliered or used as specimen trees in mixed plantings, where their colorful fall foliage and fruits will be emphasized against an evergreen backdrop. 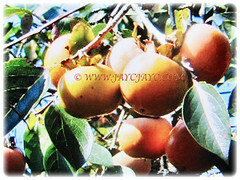 Oriental persimmons set fruit without pollination, and the fruits are usually seedless. 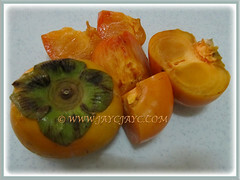 Ripe persimmons can be frozen whole and eaten like frozen custard. Ornamental landscape tree that produces an edible food crop. May be pruned as a hedge, screen or espalier. The dried ripe fruit is used in the treatment of bronchial complaints, whilst when ground into a powder it is used to treat dry coughs. Juice from the unripe fruit is used in the treatment of hypertension. Fruits, picked green and ripened in containers with the leaves, become very sweet and are considered to be antifebrile, antivinous and demulcent. 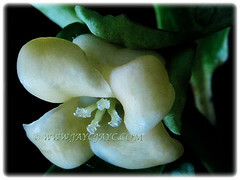 The peduncle is used to treat coughs and hiccups.